Before you can apply a coating, paint, or sealer to your garage floor, the first thing you need to do is determine whether or not the concrete has previously been sealed. This helps to determine how you will need to prep your concrete, if at all, before application. Unless you know exactly how the concrete was poured and finished, you will not know for sure unless you test it. Why test for sealed concrete? Epoxy coatings, paints, and other topical film forming sealers need to penetrate the surface in order to adhere properly. Penetrating sealers need to penetrate into the concrete in order to react with the substrate to form a sealed barrier. If the concrete has previously been sealed, neither type of product will work. So how do you check if your concrete has been sealed? Fortunately, it’s usually not hard to determine. The quickest way is to do a water drop test. This entails dripping small amounts of water over various areas of the concrete in your garage. 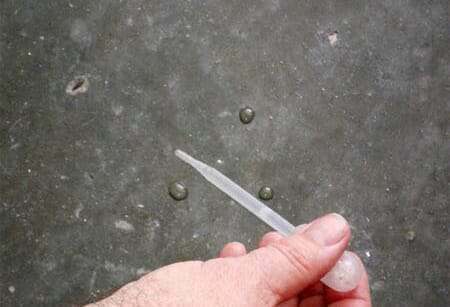 If the water beads up and the color of the concrete does not change much, like the picture below, then you definitely have a sealer on your concrete. However, if the concrete turns a darker color and absorbs the water within a few minutes, then you don’t have a sealer on the concrete. If that’s the case, you can proceed with the next step in your garage flooring project. The video above is an excellent example of how water reacts to concrete that has a sealer and how it reacts to unsealed concrete. The title is a bit misleading however. Concrete that has been sealed is not bad for epoxy. It just means that you have to grind the concrete to prep it correctly. Still not sure if you have sealed concrete? 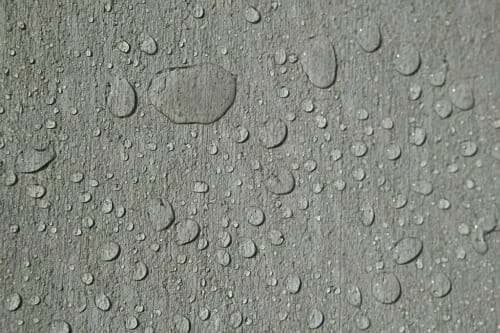 There are certain circumstances where doing a water drop test may be inconclusive and leave you feeling unsure whether there is a sealer on your garage floor or not. Hard troweled or power troweled concrete can create a smoother finish that is not very porous. Water on the surface may smear around a little bit and sit there for quite a while before eventually absorbing into the concrete or ultimately evaporating. When this happens, the next step is to test the concrete with a small solution of muriatic acid mixed at approximately 4 parts water to 1 part acid. Apply a few drops of the acid solution to the surface. If the solution begins to bubble and fizz, then no sealer is present. If the acid solution just sits there without doing much of anything, then this is definitive proof that there is a sealer on the concrete. The reason for this is that acid only works when exposed to the free lime in concrete. If the concrete is sealed, then the acid will not come in contact with the free lime and react by fizzing and bubbling. This is why acid etching sealed concrete does not work and is one of the common mistakes made when applying a coating to a garage floor. One thing we did not mention is cure and seal agents that are commonly applied to freshly poured concrete. This is a type of sealer that helps keep moisture from escaping too fast from within the concrete during the curing process. This allows for a more consistent cure and reduces the chances of cracking and curling of the surface. Cure and seals will effectively prohibit the application of sealers as well as acid etching and is another reason to test. As we said earlier, unless you know exactly what was done with the concrete, never assume it doesn’t have a sealer. If a sealer is present, it’s not a bad thing necessarily. It just means that you will have to grind the concrete to remove it. Grinding will not only remove the sealer, it will also prep your floor at the same time. If you don’t have a sealer present, then acid etching will work for concrete prep if it’s required. Some sealers and floor coating may not even require that, just a good concrete cleaning before application. If you are ever in doubt, just check with the vendor or manufacturer of your product before proceeding. I wish to stain my floor but it was sealed with siloxane about 15 years ago. Any advice? Hello Jim. The stain will need to penetrate the concrete in order to work. Many times grinding the concrete will allow this, but you should test it first. Grind a small area on the floor. If you get water penetration, then you can stain. An acetone based dye is going to work better than an acid stain. Acid stains work by reacting with the free lime in concrete. When you grind, much of the free lime and laitance that create the reaction will be removed with the grinding. If sanded with 60 or 80 grit sandpaper? Yes it will Ulysses. 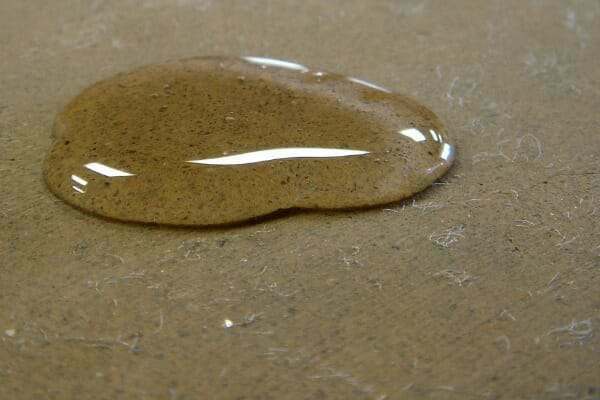 Just make sure that the current epoxy is adhered well. Pretty sure our garage floor has been sealed because gas spilled on it and the floor got very sticky in that spot. And water does not absorb into the concrete, but sits on top of the concrete. But my chainsaw sat on the floor and oil from it soaked into the floor and left no sticky residue, just an oil spot. How do I seal the floor again? And is there a sealer that is impervious to gas and oil? Do I have to remove what’s on it now??? Because if so, I will just have to live with a spotted garage floor! Hello Cindy. It sounds as though you may have a clear acrylic coating on the floor. Many acrylics will break down from petroleum products, especially gas. The fact that it got sticky from the gas spill is the clue. The stickiness generally goes away after the gas evaporates or soaks into the concrete. The oil from the chain saw most likely had enough time to eat through the coating (thus not leaving the sticky residue) and penetrate the concrete. Unfortunately, to prevent this from happening in the future you would need to remove the coating via grinding or chemical strippers in order to apply something that is much more resistant to petroleum products. In order to reseal these spots you would first need to clean the oil spots. After that, you need to determine if a solvent based or water based acrylic product was used. My garage seems sealed after I scrubbed the ground twice with degreaser and rinse away. Can I remove it by pouring muriatic acid to etch the floor. If not, please recommend some chemical strippers. I do not feel comfortable to rent a grinder. Acid won’t remove a sealer Qun. If your concrete has the bare look but repels water, then you have a penetrating sealer. These lie at the subsurface of the concrete and can only be removed by grinding. If you have a clear coating, then that can be removed chemically. The ones the work the best are solvent based paint strippers. Thanks, Shea for your reply. Can you please tell me further the difference between bare look vs. clear coating? How to differentiate them? Sure Qun. You can tell just by scrapping the surface. If you have a coating, you would be able to scrape it or scratch it with a sharp object like a screw driver. It would leave a white mark on the clear coating. If it doesn’t do that, then you have a penetrating sealer. Also, coatings are much more smooth to the touch where as a penetrating sealer feels just like rubbing bare concrete. Can a sealer be applied first before painting? Which are the best sealers that penetrate deeper on cement? Hello Sylvia. Do you want to paint the concrete or apply a coating? There is a big difference. Also, what are you trying to accomplish exactly by using a penetrating sealer? Some go deeper than others, but it is for specific conditions. Hi, How do i grind the corners of the floor if the diamond grinder cant reach all the way, will i see a difference then in the corners? Hello Brian. You need to use a small 4″ angle grinder and turbo cup wheel. You can learn more in this article about grinding your garage floor. Thanks for the reply but it still leaves me with the question before. The cup grinder is still gonna leave a bit of a round shape in the inside corners where i am left with a triangle looking unfinished piece where the grinder could not reach. What do i do there? Hope you understand what i am trying to ask. No worries Brian. The little triangle shaped bit in the far corner is not going to cause any problems. You won’t be driving or walking on that small of an area. Just make sure it is clean and you be fine. Perplexed. The concrete pool deck has a coating with fading areas. The faded areas foam with muriatic acid. The acid beads on coated area. I need to make the whole deck uniform in color and sealed. Can I just sand the coating and put another coating on the whole deck? Yes you can David. The acid beads on the coated area because it is being blocked from contacting the concrete. If you sand both areas well you can recoat. This may sound silly but is there a certain type/concentration of muriatic acid that you need to do that test, or will the stuff I can find at any hardware store work? I think it’s 31%. I need to do this test for a project at work and want to make sure I get the right stuff. You’re correct Sam. The 31% found at hardware stores and home improvement centers is what you want to use. Just dilute it to a ratio of 4 parts water to 1 part acid. Remember, you always add the acid to water, not the other way around. I have a concrete slab that was poured with a non chloride accelerator. Water does seem to penetrate it. I was wondering if I can etch it, or do I need to sand/grind it down? You can etch Austin. The non-chloride accelerator just helps to accelerate the time for the concrete to set. It has no effect as a sealer. No, you can’t Winfred. You will need to remove the paint first. RockSolid needs to bond with cement for the best performance. My basement floor is colored light gray, and water beads up on it. The finish is very smooth Is it painted or sealed? Looking to put a rock solid coating on it. It had pergo flooring over it for 20 years. Hello Dave. We couldn’t guess what you have. You can scrape it with an awl or sharp screwdriver to determine if the concrete is painted. Either way, it sounds like you will need to grind the surface. You can’t acid etch concrete that has paint or a sealer. If you use RockSolid, we highly recommend two coats for concrete that has been prepped by grinding. Hi there. We just acid stained our indoor floors and added an acrylic water based sealant. Can we also add an epoxy seal to our high traffic areas? We want something durable. Hello Michelle. No, you cannot apply epoxy over acrylic or vise versa. They are two dissimilar materials. If you want something more durable than the acrylic it would require that you chemically strip the acrylic finish first. You could then apply and epoxy coating or an even more durable single-part polyurea clear coating. Hello Steve. More than likely you do not have a sealant. If you did, the water would not soak in at all, nor would it turn the concrete dark. It’s not uncommon for old and dense concrete to develop a smooth and/or mildly polished surface from wear in high traffic areas. These areas tend to bead slightly or absorb water more slowly. I am going to be using the Rust-Oleum clean and etch , which is phosphoric acid. I have new concrete (18 months old) on the outside of my garage, the interior is 20 years old. My question is when rinsing the product out of my garage will this damage the newer concrete? Or should I use a shop vac to pick up the run off? Hello Lane. We suggest flooding the driveway with water before you begin etching and just before you begin rinsing the garage floor. The Rust-Oleum clean and etch is not as strong as regular phosphoric acid and is safe near plants and grass. If the rinse residue flows onto concrete that is already wet you shouldn’t have an issue. If you want to be extra precautious, you can always flood the garage floor with water to the point before it begins running out and then shop vac that up first, then rinse. Just don’t let any of the concrete dry at the surface until everything has been rinsed well. Will the water test work on a brushed concrete driveway apron? Our contractor said he came back to seal, but we’re skeptical because in using a garden hose or when it rains the water does not bead up but rather seems to soak in and the concrete appears darker (when wet). Would you recommend trying the muriatic acid test? The concrete is only 2 weeks old. Appreciate any tips or feedback you have. Hi Betsy. Most sealers need the concrete to cure for 30 days before being applied, though there are some exceptions. Check with your contractor to find out exactly what he used. Some will use a product called a “cure and seal”. It’s applied to concrete almost immediately after it has been finished in order to help retain moisture and allow the slab to cure better. Many of these cure and seal products are designed to flake away afterwards. Concrete can still darken depending on what type of sealer was used and depending on the finish. For broom finished concrete, some sealers will bead initially and then that goes away due to U.V. exposure, traffic and etc. It all depends on what was used. Our front porch had what looked like a deck stain on it. It had an uneven and streaky appearance, showing every lap mark. Finally unable to stand it any longer I found that rubbing alcohol would remove it with lots of elbow grease and a nylon brush. Now I see why the previous homeowner was trying to cover up the porch. There are white and gray swirls and streaks that look like a sealing job went horribly awry. It is apparently sealed (I did a water test) but not sure with what. How do I determine what it is sealed with so that I can take appropriate steps to remove it, to have a uniform appearance or at least in order to stain the surface to hide appearance if it’s not possible to remove it. Hello Jeff. Pour an ounce of acetone or MEK on the surface. Let it sit for half a minute or so and then wipe it good with a rag. If the surface gets soft, turns color and begins to come off the concrete, then you have a paint or acrylic sealer. Those types can usually be chemically stripped, though it can get messy. If the color only fades but does not get soft, then it’s a resinous coating of some kind. The only way to remove that is via grinding. If it’s a small porch, a 4″ grinder and turbo cup concrete wheel or Diamabrush will remove it down to bare concrete. You could do what you want with it then since the concrete will already be prepped and ready. The other option if it is a coating would be to rough up the surface with 120 grit sandpaper and apply a different coating. Hello Dale. Yes, it can be done, but it’s extremely messy. Grinding would be much easier, much less messy, and less complicated. I have a house that is 8 years old, but I am not the original owner. I did the water test and it changed my garage floor concrete to a darker color, but it also looked like it beaded up. I blew on it like in the video and it did not move like in the video and it left the where it moved darker. Do you think I am safe to just etch my garage floor to put down an epoxy flooring? BTW I will be using the Rust-Oleum product. Thanks. Do you have a fairly smooth concrete surface? If so and the water was eventually absorbed and did not evaporate away, then you should be good to etch.